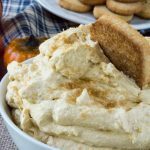 Sugar Free Peanut Butter Cheesecake Ice Cream made with just a few ingredients and easy enough for a child to make at home! 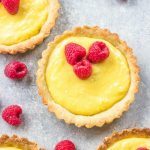 It’s Keto, Low Carb, and can be made dairy free! Making a healthier ice cream at home without sugar or eggs is pretty simple and one I now let my daughter make on her own. She just turned 12 and really loves being in the kitchen like me. Problem is I have taken over on most days and usually do the majority of kitchen chores since I’m constantly in the kitchen and of course it’s “quicker” if I just do everything. Bad news for me as a mom? I’ve made my kids too dependent on me and not self sufficient. Finding a balance between allowing my kids to make their own meals and snacks, me not taking over and simply supervising is a goal I’m working towards and one I hope to achieve with all 3 of my kids over the rest of this year. This summer without school days and homework will be the perfect opportunity to start collecting recipes for them to make on their own without worry for me that my kitchen will be in utter mess and destroyed by the end of this experience. No heat cooking is where I feel comfortable to begin with my 12 year old. So I am starting with a recipe for ice cream of course, because who doesn’t want to learn to make their own ice cream right? Since Peanut Butter is my daughters favorite as well as mine and my hubbies we went indulgent. But not so indulgent that you can’t enjoy this at least once a week if not a little more perhaps. The ingredients needed are every day staples I always have in my fridge and pantry. Made with just 6 ingredients and an ice cream machine and a few minutes of churning time and done! No heat, no eggs and oh so delicious! My daughter’s happy she can help make a snack for herself and she doesn’t need me to help her. I’m happy she can do this on her own but not only that, she wants and chooses to enjoy a healthier option for ice cream and that truly makes my heart smile. 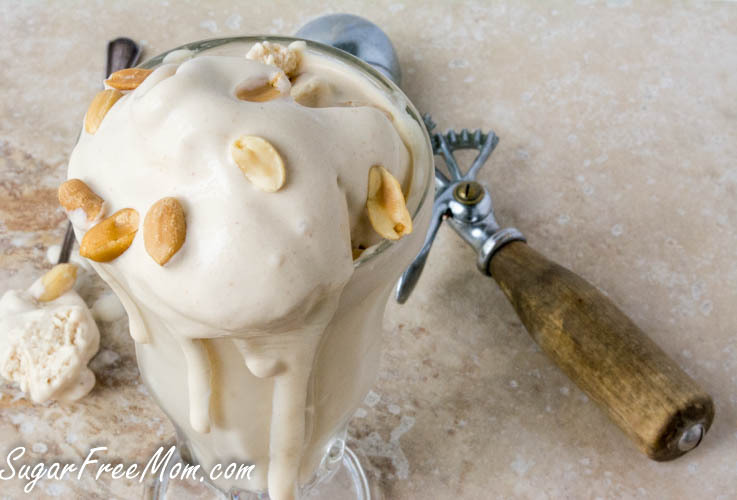 I hope you enjoy this Keto Sugar Free Peanut Butter Cheesecake Ice Cream as much as we did! Add all ingredients into a high powered blender. Taste and adjust sweetener if needed. Pour mixture into an ice cream machine and follow manufacturers instructions. Mine was perfectly churned within 20 minutes. Freeze in an air tight container for about 1 hour or until hard enough to scoop. Top with peanuts if desired! If you'd like to keep this dairy free, replace the cream cheese used for a vegan substitute, like the brand Daiya. If you don't have Swerve you can use another sugar free granulated sweetener of choice. Many other granulated subs like Pyure stevia will be much sweeter than the Swerve I used here so eliminate the liquid stevia. 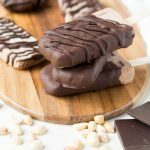 If you don't have an ice cream machine you can make these in your blender than pour into molds for frozen pops instead of churning it into ice cream. 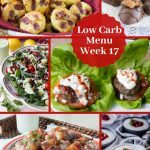 This recipe was first published in May 2015 and updated in 2018 with video. 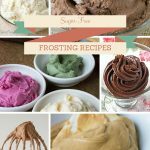 16 Sugar-Free Low Carb Frosting Recipes! 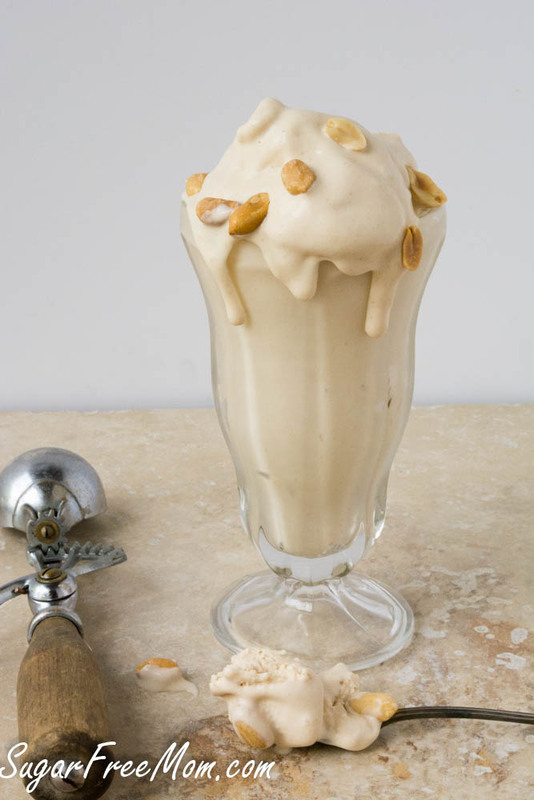 Almond milk as an ice cream base is such a great idea. I bet this would be equally tasty with almond butter. Now I’m craving ice cream! I made it with almond butter and peanut butter chocolate powder and it was amazing!!! Is there a knock at your door? I ask because you should be arrested for this recipe! I mean, when I bring my face up so close to the screen BECAUSE I’m licking the dripping, melting, deliciousness – well, you should be arrested 🙂 I’m short on words (lucky you are 🙂 ). This cooled me off just looking at it. That it made my mouth water, well, that’s not too shabby either! Thank you. LOL!!! You cracked me up!! My peanut butter loving kids would go berserk over these! this looks delish. I’m hoping it will work w sunbutter in place of peanut butter. This looks out of sight! Going to give it a whirl using unsweetened chocolate almond milk. thank you! She was nervous and didn’t want to say much but she did great! 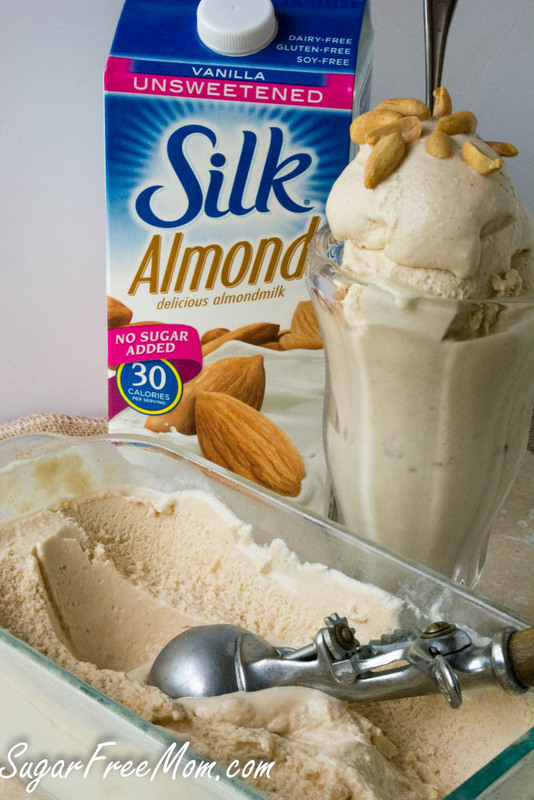 I love the idea of using almond milk in ice cream. This will be my next summer project for sure! The video is so cute, Brenda. She’s lovely like you! I am in the same boat with my kids and having them learn more in the kitchen and have it be safe. I want them to learn more this summer, too! What a great summer ice-cream recipe! I want to lick that drippy ice cream so badly!!! LOL. Your recipes always look so delicious, Brenda. I’m going to have to try this one right away! Ooo Cheesecake Ice Cream! I’m would be crazy over that! It’s great that you found something your daughter can make on her own! It looks SO good! This looks so simple to make and so delicious! 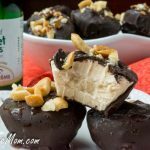 I adore peanut butter ice cream and with cheesecake AND being sugar free too…I’m making my grocery list so I can try your recipe! Peanut butter AND cheesecake! This simple ice cream sounds so perfect for summer and it’s sugar free….so good! Fantastic recipe and so nice to have your children involved. I’m looking forward to cooking with my girls this summer too! I hear you about finding a balance in the kitchen with your kids. There are times when I just want to do everything myself because it’s faster, but I have to reason through in my head that I will be such a positive outcome if I let go of the reigns sometimes. This ice cream looks like such a wonderful treat for summertime! I LOVE this recipe. I was trying to figure out how to vary it and be able to make different flavors ….can you think of a substitute for the peanut butter? Love the ice cream glass! Looks so classic 🙂 Thanks for the awesome recipe- I’m in denial that summer is coming to and end! This recipe looks amazing! I don’t have an ice cream maker, can I make it without one? I tried this ice cream today, and it’s SO delicious! The only thing I changed was I used powdered swerve instead of granular. Definitely a keeper! Thanks for the recipe. This came up on my memories from 1 year ago ..
January 24, 2015 … are you aware that a lot of news about Silk Almond Milk and other brands are not really almond milk. Google this topic and read the latest about this scam. It’s best to make your almond milk. I will try this recipe with real almond milk, tho. Sounds yummy. Could you use Splenda in this insyead of the Swerve? If so would you use the same amount? Splenda is much sweeter than Swerve so I would say reduce the amount then taste and adjust. I wonder if you could somehow use PB2 instead of peanut butter and Neufchatel instead of cream cheese, any thoughts?? Also, the nutritional information given, is that for one serving or the 8 servings? Thanks! Looks awesome! You could make those subs i think without issue, but since PB2 has sugar in it, the nutrition info will change and it may not be as thick because the PB2 is mixed with water, so I would say use less water to keep the PB2 as thick as regular peanut butter. Serving is for 1 piece out of 8 large slices. I have to point out – almond milk isn’t high protein, at all. It’s low in all the macronutrients, really, it’s mostly water; 1g protein per cup, vs. 8g in dairy milk. Your daughter is adorable, and it’s so great that she’s already getting to find her rhythm in the kitchen. She’ll make a great chef some day! Thanks for posting this recipe. 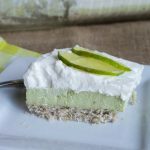 It’s refreshing to see a sugar free dessert that isn’t just packed with splenda. Yuck! I can’t wait to try this! Brenda, which brand and model ice cream maker do you use? I actually have the ice cream attachment for my KitchenAid and love it! I’m going to try this using PB2! Low fat, low carb pressed peanut butter powder. 1.5 grams of fat versus 16. We love it here at our house! 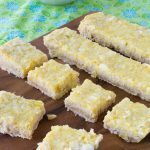 Thanks for the recipe – definitely going to give this a try! One question: do you think I can use fat-free cream cheese? Thanks! I’m sure it would work just not sure if it would be as creamy. I’ve not tried but I would say mix in blender and make popsicles instead. I made this and it was very tasty. Immediately after churning the texture was creamy and smooth and so so good. However after freezing it was icy and hard. The next time I make it I will plan on eating it right away! Disappointed in the fact it doesn’t freeze well for later. I have made this and I found if I use real vanilla extract and swap out 1/2 cup heavy whipping cream mine stays smooth and creamy in the freezer. Looks great, I’m so excited to try this. Is there a substitution for the flavored Stevia? I would like to know this too. All of the flavored stevias seem really fake tasting. Could I just use vanilla extract? I love all the flavored stevias, I love the toffee flavored in my coffee, the berry flavored in seltzer water, the chocolate is great for chocolate desserts. I don’t think they taste fake but you can use vanilla if you want. Oh my! I just made this into “creamsicles” in pop molds. I was able to get 12 pops out of this exact recipe. THEY ARE HEAVENLY. I urge you, if you’re chicken about using an ice cream maker, or if you don’t have or can’t afford one, try putting this blended batter into pop molds and freezing. AMAZING! Thank you so much for a spectacular summer treat! I have made this three times, I love this ice cream recipe. But I can’t get it to remain scoopable after its been in the freezer. I have tried adding xantham gum and to no avail – anyone else having this problem? Try adding 2 tbsp of vodka which can help with icy texture. Looks delish. I’m thinking of trying this w/o the ice cream maker step and just putting the mixture into popsicle molds. Wonder if that will work well? The 5.8 gm carbs is just great, and I love ice cream …. I have this bookmarked for mass consumption soon ! Wow! We just love this recipe. I exchanged chocolate almond milk and add some cocoa powder, chocolate peanut butter ice cream. I found that if I can stir this just before it freezes hard I can stir it up enough where you can scoop it out easier. You leave it kind of fluffy and not packed down. The almond milk and cream cheese makes this so much lighter than heavy whipping cream base and not so rich. Going to use this base and try for blueberry cheesecake ice cream. Update.. I have used real vanilla extract and exchanged out 1/2 cup with heavy whipping cream. Mine is now staying smooth and soft even 2 days in the freezer. BTW the blueberry ice cream was great! Val, how did you adapt this for blueberry cheesecake? just leave out the peanut butter, sub 1/2 cup whp cream and how many cups blueberries did you use?? sounds yummy! Honey this ice cream is everything!! 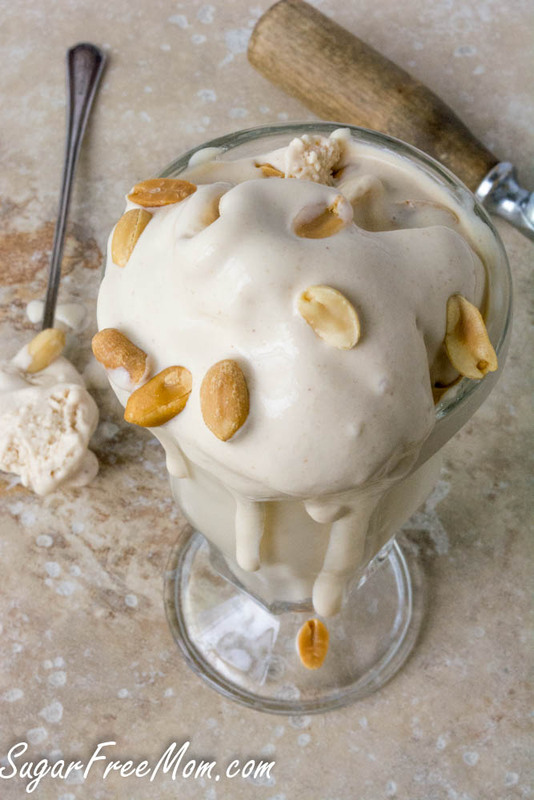 I had peanuts on hand and just grounded it up with the ice cream in my Blendtec and I used heavy whipping cream as that is what I had on hand!! 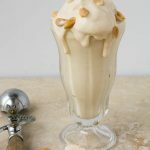 It is sooooooooooooo delicious and simple and I will make this often as I am always craving ice cream! I love the simplicity and the taste is just amazing!! Thank you thank you thank you!! Peanut butter is usually peanuts plus a little salt, and I’d imagine the salt to be important in preserving creaminess of the recipe in the fridge (lowering the meltimg point of the water so that it keeps from forming ice crystals as quickly). At the same time, maybe the salt in peanut butter is too low in relation to the other melting-point-lowering factors (the components of almond milk primarily; the fats won’t affect freezing of the water but will keep crystals from getting too large and ‘crunchy’). Did you also add salt, or did the end product stand up well over time in the freezer? What if no ice cream machine? Any way around that? Maybe if you have a Vitamix or blendtec blender, really high powered might work. This is delicious. It is the first time I made ice cream. I only had regular flavored Stevia so that is what I used. I also used swerve. Thank you. I will be making this again. Maybe with some mini, sugar free chocolate chips. Thanks again. I’m going to try this with coconut milk and maybe use maple syrup instead of the stevia, I’m not a fan of the taste of stevia. I wonder if this could be made with fat free cream cheese and PB2? Fats are critical in making ice cream stay soft. The “trick” of ice cream is that you are creating a colloidal suspension – which is essentially just a fancy word for lots of little globs of fat interspersed throughout the water – which itself is ‘foamy’ with little pockets of air throughout. This keeps the water component from freezing into a large solid mass; it still freezes solid, but the ice crystals are small enough that they melt immediately in the mouth and don’t offer significant resistance. If you’ve tried low-fat ice creams from the store, they generally substitute indigestible compounds and sugars for the fats, which increases the calorie and carb contents, and simultaneously drastically increase the churning effects to introduce much more air to the recipe, which lowers the amount of product you get in any volume and thus lowers the calorie/carb content. You can do the first at home – alcohols, glycerin, etc can affect how “hard” the ice crystals become to a limited extent – but the higher-powered churning would require machinery which just isn’t available to most of us. Maybe using the KitchenAid ice cream churner attachment (which is always supposed to be used at speed “1”, stir) with a higher speed of the mixer (“2” might be too much though) combined with more time in the freezer would do it. Hi Brenda, I love your recipes. I use your recipes all the time. You use swerve in a lot of your recipes. I don’t choose to use swerve , I only use liquid stevia or powdered stevia. If a recipe of yours calls for 1/2 cup of swerve & with stevia you only need a small amount to be sweet will it make a big difference to only use a few drops instead of 1/2 cup?? I don’t mean taste wise but texture ? I hope that made sense. Unfortunately on some baking recipes it will make a difference in texture, but in ice cream recipes like this I don’t think it will be a problem. I was very fortunate in that my mother absolutely hated cooking and meal prep, so when she had to be hospitalized when I was eight years old, Dad taught me to cook. From that point on, the kitchen was mine, and I’ve never looked back. I’m now 65, retired, and still enjoy cooking, even though I live alone and don’t cook for others anymore. 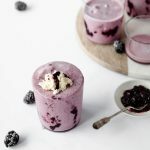 This sounds like seriously delicious ice cream, but I don’t have an ice cream machine, and won’t be buying one–I live in such a tiny apartment, I have to go outside to change my mind (but I love the little space)–so will just have to drool over the photos and recipe. This looks tasty and the pictures look amazing! I am going to give this recipe a try. My wife is not a big fan of peanut butter. The kids all love it, and so do I (perhaps unnaturally so). This was our second try at ice cream after getting a shiny new Cuisinart, after mint chocolate chip (which turned out quite well too, definitely on par with store-bought). 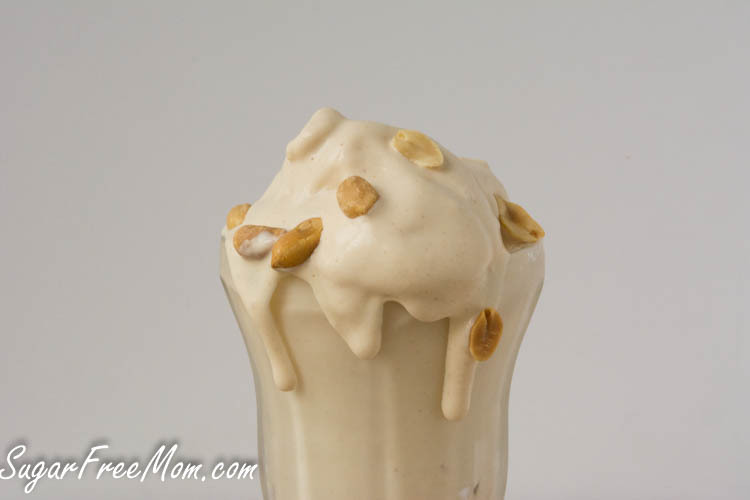 Mint chocolate chip has always been my wife’s favorite ice cream, so after treating her to that I felt safe indulging myself and the kids with this peanut butter-based recipe. Well, mint chocolate chip is no longer my wife’s favorite ice cream! We made a few substitutions of course to fit what we had. We use Truvia for just about everything, so a quick swap of 1/4 cup Truvia for the 1/2 cup Swerve was easy enough (Truvia is just over twice as sweet as sugar/Swerve, so would be just under a 1/4 cup, but there was also the extra toffee-flavored sweetener so we winged it at 1/4 cup altogether). We also didn’t have any flavored liquid stevia so used a teaspoon of toffee flavoring (LorAnn brand, as the various extracts and flavorings definitely differ in strength from brand to brand). For peanut butter, our favorite brand is Adam’s since it has just 4 grams net carbs per 2Tbsp (compared to 6 or 8 for Skippy or Jif’s “Natural” variants) or 16g net for the whole 1/2 cup enchilada in this recipe. And our Philadelphia Original cream cheese sports 8 grams of net carbs in the whole bar, so our overall net carbs turned out to be 3g of net carbs for 1/8th of the total recipe. We finally added a tablespoon of vegetable glycerine to keep ice crystal formation down. Made a little over a quart of ice cream (8 half-cup servings which would be a full quart overall seems pretty much exactly right if slightly on the low side – we might get 9-10 half-cup servings out of a batch of this instead; actual density depends on time in the churner and how heavily it is mixed prior to churning). Overall, a great way to “spend” 215 calories and 3 net carbs at the end of a day (and honestly, we usually just do a quarter-cup serving for a sweet treat, so it isn’t even that hard to fit into the day’s budget)! Would coconut milk be 1:1 to the almond milk? We gave an almond allergy in my house, but this looks delicious!! Yes that would be fine. This looks yummy. Thanks for the recipe! Made this tonight with almond butter and my 4 year old and I are obssessed!!! THANK YOU! So yummy! 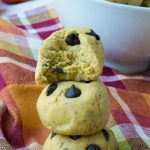 While the recipe is technically free of sugar, the peanut butter, 1/2 cup, is loaded with 6 grams starch which is 3% of the peanut butter calories. Starch doubles blood sugar in 15 minutes and takes blood sugars up 5X higher in 30 munites which is why I NEVER eat starch because it is dissolved in the mouth and never makes it to the Fiber Faerie Myth that lives in the gut to slow it down. So I would never make a peanut butter anything. Looks sooooooo good! I love peanut flavored anything, but especially ice cream!